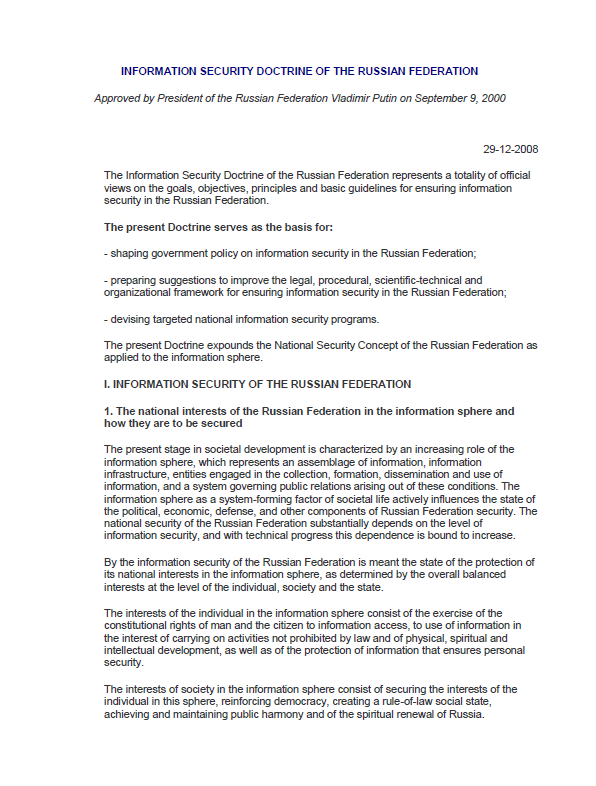 The following is an English translation of the official information security doctrine of the Russian Federation signed by Vladimir Putin in September 2000. An updated version of the doctrine was signed by Putin in December 2016. – devising targeted national information security programs. The present Doctrine expounds the National Security Concept of the Russian Federation as applied to the information sphere. – threats to the security of information and telecommunication systems and facilities whether already deployed or being set up on the territory of Russia. – a decrease in the spiritual, moral and creative potential of the Russian population that would substantially complicate training manpower resources for adoption and use of newest (including information) technologies, – information manipulation (disinformation, information concealment and distortion). – the blocking of the activities of Russian media in explaining to foreign audiences the goals and major thrust areas in the Russian Federation’s state policy and its view of socially significant events in Russian and international life. – attempts at unsanctioned access to information or attack attempts against information resources and the information infrastructure of the federal executive bodies implementing Russian Federation foreign policy, of Russian representations and organizations abroad and the representations of the Russian Federation at international organizations.